As Nigerians we are free to react in whatever way, negatively or positively to the news of United States’ refusal to sell arms to Nigeria but while we do that, we must understand that this is our country and our national security is at stake. We need not be reminded that there cannot be national development if there is no national security. They are mutually reinforcing. The Leahy act, we have been told, prohibits the US Department of State and Department of Defence from providing military assistance to foreign military units that violate human rights with impunity. It is named after its principal sponsor Senator Patrick Leahy. Unfortunately, Nigeria is among nations that are affected by this law as a result of human right abuses by the armed personnel. Of course, it is not debatable, human right is a challenge to every counter terrorism operation anywhere in the world, including those involving the United States. Explicably, the politics of arms acquisition can be seen from different perspectives. It can be regarded as a way of building relations among countries. To that extent, it may mean friendship, support or rejection. Nations especially the supplier may also use it to influence certain policies of the buyer Nation. According to Salawu Aminu, weapons sales and/or procurement could provide a means of influencing some decision making processes in the recipient nation by suppliers noting that weapon sales often enable suppliers to have leverages over recipient nation. Essentially, this tends to be the case where the recipient relies disproportionately on a particular supplier for their weapons. In this case, Nigerians should be deeply concerned about the factors that led to the refusal of the arm deal. Could it really be as a result of the human right abuses or gay rights? If it is the issue of human right abuses, sure, it is a global challenge in counter operations. And there are many countries whose cases of human right abuses surpass that of Nigeria that United States warmly offers military assistance. Could the refusal be a proportional reaction to Nigeria’s clear rejection of the gay right offer? This is quite valid. The Obama administration no doubt, adopted gay right since 2011 as a cardinal point of the United States foreign policy and it has demonstrated commitments to promote it to every corners of the globe. And Africa being a continent of dependent nations is the fertile place to sow it. It is instructive therefore, to note that if President Muhammadu Buhari had submitted to the evil proposal of gay rights, which is atop the agenda of the United States global outreach, Nigeria would have been delisted from the nations affected by the Leahy act. This is the reality of American diplomacy since gay right has become a priority. 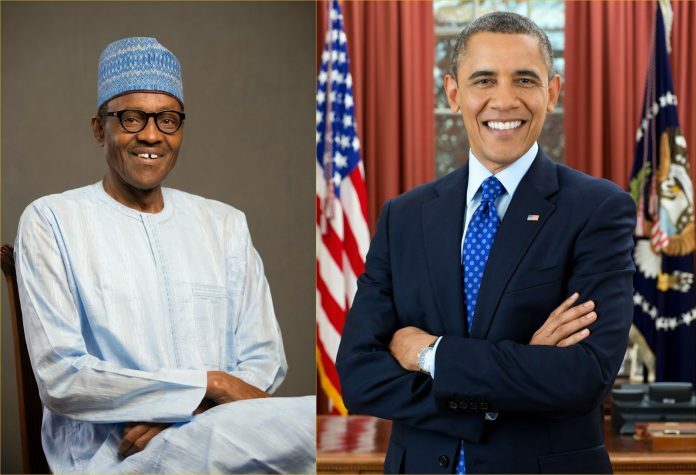 In the same vein, the refusal of the Obama administration to sell arms to Nigeria has resuscitated the issue of diversification of the economy to the front burner. It is a reminder of the over dependence of African states nay Nigeria on external actors for solution to their problem. For instance, the United States is traditional ally, and is Nigeria’s major trade partner in crude oil. Despite campaign promises to diversify the economy, the proceeds from this trade still greatly define the Nigeria economy from one administration to another. So why wont the United States desire to dictate the tune Nigeria should dance. This writer had earlier in June 2015 in one of his articles, advised President Buhari to be courteous of his romance with the west as it could be catastrophic to achieving his agenda for Nigeria noting that the administration should view the global environment from a multilateral prism rather than hegemonic. Furthermore, another important question is; what is the state of the Nigerian Defence Industries Corporation established in 1964 to supplement dependence on external arms procurement. Have there been improvements that can influence Nigeria security architecture. This should be a major source of concern for our security managers particularly in this time of counter-terrorism. No nation can succeed in the fight against terror without a functional security industry. More so, one may also want to ask if this leahy act will also be invoked in disguise as Nigeria crave the assistance of the United States in repatriating looted funds starched in American banks. This is a serious issue that takes semblance of the British earlier refusal to assist Nigeria in the wake of the civil war. Nigerians must brace up for the challenge.